Topaz's low profile flood lights are perfect for landscape lighting and bright enough to illuminate building façades. 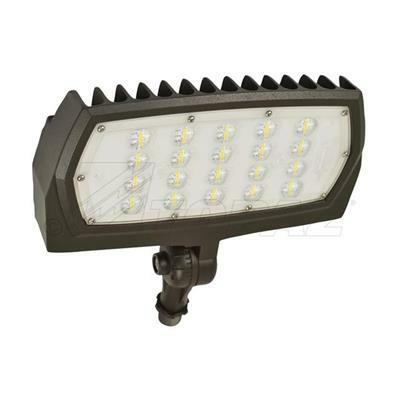 These powerful flood lights deliver a wide angle NEMA 7Hx6V light distribution providing maximum light spread when lighting signs and washing walls or façades. Trunnion mounted flood makes it easy to replace wall mount applications for walkway illumination, or areas requiring security lighting. These fixtures are DLC qualified and are an economical option to replace standard HID floods saving up to 75% energy and providing up to 50,000 hours of life.